Given Up on Shaving with an Electric Razor? 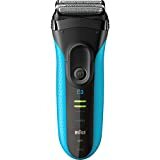 As some of you might know, results can be pretty frustrating if you don’t know how to shave with an electric razor using a proper technique. As is the case with any male grooming practice, from manscaping to nose-hair trimming, there's always a technique or process that makes life easier and gets you better results. I know men who have tried it once or twice and quickly gave up on it, but knowing the proper way of shaving using an electric shaver can save you time and make shaving more practical. 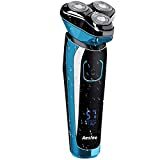 You might have just bought a new electric razor or maybe you received it as a gift, (believe it or not electric shavers tend to be very common gifts to give to younger men. In any case for whatever reason, you decided to try this shaving method and you might be disappointed with the results after your first try. Well let me tell you something. Most men are! 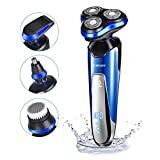 Apart from not giving the desired results, they get a bad shaving experience because they're not sure how to shave with an electric razor without irritation? can lead to rashes and skin irritations. Do not get discouraged though, in this article I will share with you some tips on how to use an electric razor in the best way to get the results you want. To get a deep and super smooth shave with an electric razor you have to consider certain factors. In addition to the pre-shave preparation (this is the most commonly skipped step, yet it’s essential), you have to know some basic techniques, and as you’ll see, it's not hard at all. Let’s start with the first and most essential step, choosing the right electric razor for your needs. The first step to a good shave with an electric razor is choosing the right one for you. The market offers a wide variety of electric razors ranging in different prices for all types and preferences. What you choose should all depends on the thickness and length of your beard and the sensitivity of your skin. You can choose a razor only for dry shaving or a more advances wet & dry option. With a wet & dry razor you can use it in the shower but what’s most convenient when using these waterproof electric razors is that you can use them even when applying gels and other types of shaving creams on your face. The pre-shave preparation for these two types of razors is different. With the wet shavers the whole shaving experience will be much more comfortable, however the process is a bit longer. Now there essentially two types of electric razors, the foil shavers and the rotary shavers. These two types use different technologies. For a detailed understanding of the difference between the two check out this post by Remington. Foil shavers are considered to be less stressful on sensitive skin than the rotating head razors. In my opinion, however there is not much difference, and the only important thing is the quality of the razor. The high-end electric shavers will work well on all skin types. If you’re looking for a recommendation, here are the top 3 electric shavers which are currently available on the market. The Braun series 9 electric shavers are really top quality electric shavers. At the very high end of the range they have the Braun Series 9 9296cc which is a wet & dry rotary electric shaver. This machine is quite expensive but it is, without a doubt, the absolute best electric shaver on the market. So, if it is within your budget, I do recommend you invest in the Braun 9296cc. It is the most powerful shaver out there and ideal for those 2 to 3 day old facial stubs. This means that if you have one of those beards that grows quickly and thick, and you hate shaving each and every day, the Braun is the best choice for you. This really is a monster electric razor with a powerful motor that never gives up. You’ll see that it will be well worth the initial investment. Also, as with most Braun products, it is a durable, well-made product that usually lasts for a very long time without any issues. A cheaper alternative to the Braun is the Panasonic ES-LV95-S Arc5 Electric Razor. This is also a rotary razor that can be used in wet or dry conditions. It is the only foil razor with 5 blades. 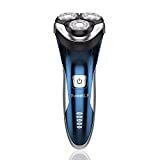 Now more blades does not necessarily mean better shave quality, but this electric razor does guarantee a very clean shave thanks to its very powerful motor that works at 14,000 rpm. Finally, if you prefer a rotary electric shaver, then the best choice on the market must be the Philips Norelco Series 9000 Wet & Dry Electric Shavers. This is not the usual rotary electric shaver you might be used to seeing your father use. 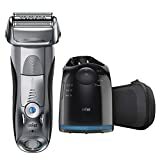 With an elevated shaver head, the three rotary blades on the Philips will flex and tilt to the contours of your face much more easily that the traditional rotary shavers. Philips has named this as the 8-direction ContourDetect Heads. This shaver can be used on stubble and also on longer beard hairs that haven’s been shaven for a while. Like the other two electric shavers mentioned above, it’s a wet & dry shaver and and as far as rotary shavers go, the Norelco Series 9000 electric shavers will provide the closest shave. Now that we’ve seen what are the best choices out there, it’s time to focus on the best way to shave your using electric shavers. There are essentially 3 phases to obtain the perfect shave with an electric razor. Before you start using your brand new electric shaver, read the manual. I can hear you screaming right now ..... Come on! Who reads manuals? We’re men. We shave every day, we don’t need a manual, right? Well, if you want to do this correctly, then I suggest you take a few minutes to go through the essential parts of the manual. Every electric shaver is different in terms of technology and design, so it is important to know the the peculiarities and strengths of the machine you will be using. This will ensure you can take advantage of the best features that are available at your hands. Going through the manual will help you learn to leverage your razor to its fullest potential and also take care of it for a longer lasting life. 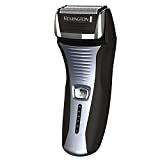 A good electric shaver is not cheap, and therefore it is in your interest to make sure you maintain it properly for optimal performance and longer lasting use. You must know that in order to get an exceptional shaving experience, apart from a good handling technique, it is essential you learn how to properly maintain and clean the shaver. Keep the cutting head always in the best condition and change it according to the manufacturer's recommendations. The performance will remain constant over time and you'll avoid irritating the skin with blades that have lost their sharpness. Some modern electric razors, like the Braun 9296cc come with basic automatic cleaning that cleans, lubricates and charges the shaver automatically. Others must be cleaned and lubricated manually . Check out this e-how video to learn how to clean your electric foil shaver. The trick to getting a deep and smooth shave lies in the skin preparation phase. A good pre-shave preparation will allow you to remove the hair without any effort. Unfortunately many men think that this step is a waste of time, but, believe me, any extra time it takes to prepare your skin for the shave will be more than made up for in the subsequent shaving process. Shave in the shower or right after taking a shower. If you have a waterproof electric shaver (wet & dry type) then you can go ahead and shave directly in the shower. If your shaver is not waterproof, then you should shave directly after taking a shower. The water temperature should be neither too hot nor too cold, just hot enough to be comfortable on the skin. The hot water will help open the pores of the face and soften the hair allowing for an easier and faster shave. At the same time this also reduces the chances of irritating the skin. If you’re in a hurry and don’t have time for a shower before your shave, then you can wet a clean towel with hot water and press it lightly on your face a minute or so. Applying shaving gels, shaving creams and pre-shave alcohol-based lotions (or talc based alternatives, if alcohol irritates your skin) will help you get a deeper and super smooth shave because in addition to keeping the hairs raised for the shave, they also help eliminate the excess oil in the skin. You will notice that all the steps mentioned above are aimed at obtaining the prerequisite conditions for an easier and smoother shave. In other words, your want to relax your skin and soften the hair. The trick to the actual shaving process is finding the right angle and more comfortable technique. This means that the ideal shaving technique will vary from one person to the other depending on the skin type, the thickness of hair and many other factors. For example, some men feel that shaving against the grain gives them the best shave, however others will find that shaving against the direction of hair growth will cause irritation to the skin. It is therefore important to try different methods and find the one that suits you best. How do I find the direction of hair growth? Gently rub your fingers on the skin and notice which direction feels smoother. This is the direction of the hair growth. The other direction which feels pricklier and resistant is the direction against the grain growth. For those of you who, like me, have sensitive skin, it is better to start shaving on the most sensitive areas first. Using the razor when it is still cold on the most sensitive areas, such as the neck, will lessen the stress on the skin. Some shavers will tend to heat up after a few minutes of use, and this heat will cause skin irritation. 1. Smooth out and tighten the skin being shaved by holding down the skin with one hand while maneuvering the razor over the taught skin with the other hand. This will flatten the area being shaved and will allow you to obtain an easier and more efficient shave. 2. To avoid irritation remember not to press too hard on the skin and not to pass on the same area over and over again. 3. Foil razors work better when you move them up and down, while for rotating head razors use circular movements. Today, most electric razors, both the rotating head shavers and the foil ones are wet & dry. Producers are trying to give their customers what they ask for and many men want to use shaving cream with an electric razor and/or shave with electric shaver directly in the shower. Besides the convenience and efficiency you get from shaving directly in the shower, many users prefer the feeling of freshness and delicacy that shaving with foam and gel gives. 1. If you tend to shave first thing in the morning, wait at least 15 to 20 minutes after you wake up. This is because the face is slightly swollen in the morning and the hairs are more difficult to cut. 2. Before applying gel or shaving cream rinse your face with warm water. This will open the pores and soften the hair follicles. 3. Apply the shaving cream/gel by massaging it into the face and neck and leave a thin layer of foam. The massage will help to soften the hairs. Do not let the foam dry out. If need be use warm water to keep it moist. 4. If you are using a fully waterproof electric shaver, rinse the cutting head under running water regularly to unclog it from hair or foam build up. Dry shaving is generally a faster process, but does not give you as close a shave as the wet shaving option. Having said this, sometimes, dry shaving is your only option, and is ideal if you are in a hurry or you need to shave in a public place, like the airport on long business trips. Some men dry shave with their electric razor in the car or at work, for example. The dry shaving process is easier and does not require gels and shaving creams. Unlike the wet shaving process. For best results when dry shaving with an electric razor the skin and the hair should be completely dry before starting to dry shave. This ensures the best results, because the cutting head eliminates the hair more easily. You should still wash your face before, however make sure you let it dry thoroughly before beginning to shave. There are some electric shave lotions created especially for dry shaving that help you get a better experience. They are produced with alcohol that dry the skin oils and keep the hairs raised during the shave. After shaving, it's good practice to apply a moisturizer or similar after-shave product, to keep your skin healthy, get a fresh feeling and reduce the chance of skin irritation. Moreover, some aftershave products like the Decleor are intended to slow down the regrowth of hair and avoid you the hassle of having to shave again after a few days. Applying an after shave moisturizing lotion is especially important if you used an alcohol based pre-shaving product, since alcohol has the effect of drying the skin. You’re almost done! Don’t forget to clean and lubricate your electric razor so that you find it ready to use on your next shave. Use the cleaning brush supplied to clean the shaver from the residues after each shave. Do not slam the razor on the sink to free it of hair residue! Empty the razor of all the accumulated hairs using the brush that came with it, then sprinkle a little bit of lubricant on the blades. It’s important you don’t clean it under water after applying the lubricant as otherwise you will wash it all off. Change the cutting head every now and then, according to the manufacturer's recommendations. Many men never change the cutting head and eventually find themselves with a useless razor which they throw away. However it’s cheaper and easier to replace worn blades over time and keep it working in perfect order. The maintenance of the electric razor is important. Razors are like cars: they give you more satisfaction if you take care of them and replace any worn parts. 1. Prepare the skin well. It must be free of dirt and sebum (the skin's natural oil). Use a pre-shave product containing alcohol. They are formulated with ingredients that ensure the protection of the skin and minimize the chances of irritation. 2. Start with the sensitive areas first, while the razor is still cold. The motors in the electric shavers will tend to generate heat after a few minutes of operation, especially the cheaper brands. This is bad news for people with sensitive skin since the heat will increase the chances of skin irritation. 3. Hold the razor at the right angle and direction for your shave. Use your free hand to pull the skin as you shave, so the hair will stand straighter. This ensures maximum contact with the skin and reduces the shaving time. 4. Press the shaver gently on the skin and do not spend more time than necessary on the same area. .. and make sure you replace the cutting heads every now and then. The steps outlined above will not only ensure you get a better shave, but it will help you prolong your shaver’s operating life. If your first shaving experience with an electric razor did not go well or you still have not found the technique that suits your skin type, do not give up! The skin may take several weeks to adjust to the new technique. So, my advice is to keep at it for a couple of months. Shaving with an electric razor is generally an easy task, but if you are a beginner or you just can’t get a shave that satisfies you, the above tips can help you. I have shared with you the most essential pointers on how to get a super smooth shave with an electric razor. Follow these steps and see how this helps you get a more positive shaving outcome. Do you have any other tips or suggestions on electric razor shaving for your fellow readers? Let us know by leaving a comment below. Remember. A good electric razor will make a big difference to your shaving experience. Therefore, invest in one of our recommended options below and you will be set up with a good tool for years to come. 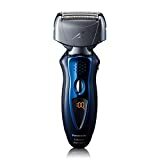 To conclude, here's a dynamic list showing the current best selling 10 Men's Electric Shavers based on amazon.com sales. This list is updated daily, based on latest purchases. 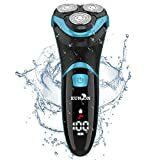 Want to find other Electric Razors on Amazon. Check out our Amazon Quick Search tool below. Applying shaving cream after wetting your beards makes them soft and very easy to shave – so you don’t have to use lots of force when shaving. In return you prevent ingrown hairs and other skin issues which are always caused by dry shaving. Thanks for this very informative post. Will surely try some of your tips.